Varun Dhawan Birthday: 5 Best Performances of the Kalank Actor That Prove He is More Than Just a Box Office King! Shah Rukh Khan and Salman Khan to Reunite For Dabangg 3? Sachin Tendulkar Birthday Wishes & WhatsApp Messages: Send Greetings to Master Blaster on His 46th Birthday With These Sweet Quotes on Facebook and Twitter! Bride Slammed for Her ‘Period-Stain’ Tampon Bridal Dress That Is Going Viral Online! 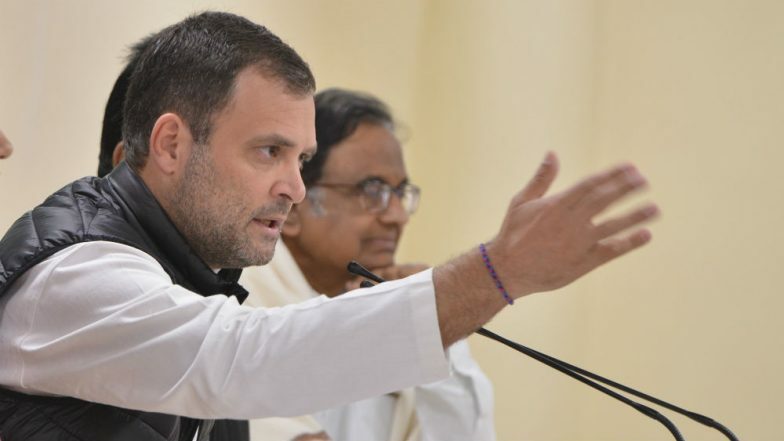 New Delhi, April 11: The Congress party has written to the Ministry of Home Affairs (MHA) alleging threat to its president Rahul Gandhi's life. The Congress party has alleged that Rahul Gandhi's security cover was breached. Seeking probe, three Congress leaders, in their letter to Union Home Minister Rajnath Singh, has asked the ministry to ensure that the protocol relating Rahul Gandhi’s security detail is strictly followed. In its letter, the Congress party said a green laser was pointed 7 times at Gandhi’s head when he was interacting with the media after filing his nominations paper from Amethi Lok Sabha seat in Uttar Pradesh on Wednesday. "A laser (green) was pointed at his head, intermittently on at least 7 separate occasions in a short period; including twice at his temple on the right side of the head," the Congress said. The Congress party also submitted a video clip of Gandhi's interaction with media persons. "A perusal of the video by various persons including former security personnel leads to a prima facie conclusion that this laser could emanate from a potential weapon such as a sniper gun," the party said in its letter. Citing assassination of Rahul’s father and grandmother, former prime ministers Rajiv Gandhi and Indira Gandhi, the Congress asserted that the security breach was “a cause of grave and pressing concern”. Rahul Gandhi Promises to 'Scrap NITI Aayog', Reinstitute Planning Commission if Congress Voted to Power. “Even a possibility like this is a cause of serious alarm and concern pointing towards a breach in the security of Congress President Shri Rahul Gandhi. All of us are deeply shocked and distressed at the possibility of the Congress president being targeted by a potential assassin. We urge you to immediately take note of this grave and unacceptable security threat as also the security lapse in the security of the Congress president... This is also an alarming lapse on part of the UP administration which is responsible for the peripheral security," the Congress leaders said. The Congress party said Rahul Gandhi's safety the “first responsibility” of the central government and the home ministry. "Rahul Gandhi being a high risk target is especially vulnerable during the extensive electioneering in the ongoing 2019 elections," the letter said. World Book Day 2019: Best Quotes on Books That Will Inspire You to Grab One ASAP!